Workers Union mother body, Zimbabwe Congress of Trade Unions (ZCTU), has called for a national demonstration on Thursday against new financial reforms which it described as treachery on the back of President Emmerson Mnangagwa's call yesterday that people should brace for pain as the government seeks a new economic path driven on neoliberalism. Addressing the media in the capital today, ZCTU President Peter Mutasa said the government's new economic reforms leave the general populace at the mercy of price hikeS and salary distortions. "The new measures, instead of solving economic crisis that the country faces, increases taxation and fail to find solution to the cash crisis and high price of goods and services amongst a host of issues affecting workers and the general public. "The introduction of a 2 percent tax on every dollar on all electronic transactions which has a direct effect of overburdening the already overtaxed and underpaid workers... "
Mutasa said there is an expectation of a huge turn out expressing confidence saying the workers union body has been in touch with the civil society and have assured them of their attendance. "From the inquiries, from the civil society, from ordinary citizens, we think that we have the capacity to close some of the major cities on the 11th of October 2018. "But even if we don't completely shut down, but we are clear that we would have sent a message that the citizens have completely refused the monetary policy and fiscal policy that have been announced without consultation and are calling the government to the table." 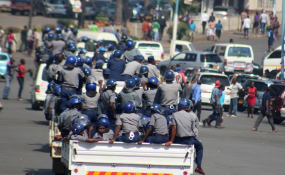 The ZCTU has in the past called for protest that left ugly scenes as the state unleashed security agents and to disperse them with some being thrown behind bars.